UMG Nashville is planning a Downtown Shutdown during Country Radio Seminar, a unique event which is open to the public as well as CRS attendees. 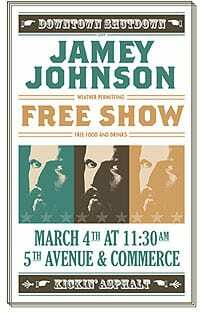 On Wed., March 4 at 11:30 AM, Mercury’s Jamey Johnson will take to an outdoor stage at the corner of 5th Avenue and Commerce to perform a free concert, weather permitting. While many parties and performances surrounding the annual conference are only for those with CRS badges or invitations, UMG is taking this opportunity to reach out to the community at large for exposure, even luring them in with free food and drinks. Tomorrow night (2/25) Johnson will perform on an encore airing of NBC’s Tonight Show with Jay Leno.